And the winner is… Tash Russell. Congratulations, Sander from Echoes And Dust will be in contact with you via email to confirm the tickets and everyone involved hopes you have a blast over the weekend! 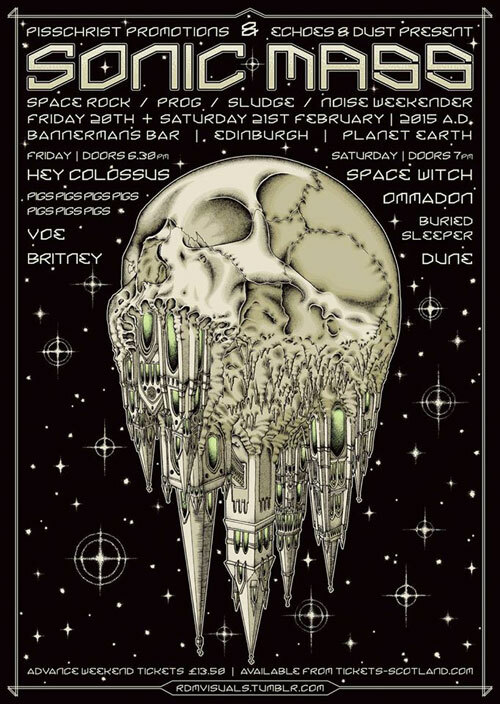 Established doom promoters Pisschrist Promotions are teaming up with Echoes And Dust’s metal team to present the inaugural Sonic Mass Weekender – 2 days of space-rock, prog, sludge, doom and noise in the infamous surroundings of Bannermans Bar in Edinburgh. Headlined by Hey Colossus on Friday and Space Witch on Saturday, with Pigs Pigs Pigs Pigs Pigs Pigs Pigs, Dune, Voe, Ommadon, BRITNEY, Buried Sleeper and Star Turbine all making appearances, you can expect a full assault on all your senses. Tickets are available now at just £13.50 for the whole weekend from Tickets Scotland and up to date info is available on their Facebook Event.